Bretz Interiors is a family owned business located in Lakewood and serving the greater Denver area. In operation since 1959, we focus on delivering high quality products and exceptional service to every client. Learn more about us. With so many options in window coverings these days it is easy to get overwhelmed in the buying process. We can help you make your purchase process simple and fun. Schedule your free in-home consultation today! 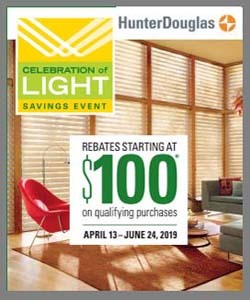 We carry a wide variety of quality blinds, shades, and shutters including the complete line of Hunter Douglas Window Fashions and custom fabric drapery and top treatments. Learn more about our window covering selection. Relax, we’ve got you covered! The flooring in a room accounts for as much as 50% of the room’s impact. It has the ability to transform the look and feel of a home. We can help! Learn more about our selection of flooring. Visit our Showroom or call to more learn today!